Coming off an amazing weekend is hard to do. I love how during the Holidays we get to reconnect with so many fun people in our lives in addition to the ones we spend Christmas Day with. We got our last pre-Christmas weekend started in Dallas on a double date with my college roomate and her adroable boyfriend. We all love looking at Christmas lights. 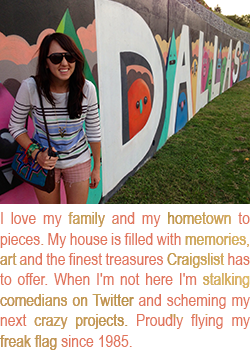 Since Jordan and her boyfriend are just getting settled in Dallas, Markus and I lent our expertise to the evening and built a robust itinerary of Dallasite Holiday cheer. We knew we wanted to do a dinner out at someplace noteworthy that wasn't bank breaking at the same time. I had heard such good things about Rise No 1 but assumed it was on my "never in a million years" list as most good souffles need a little bit of flour. 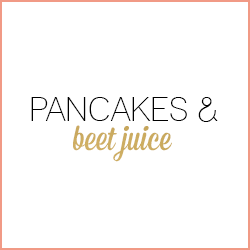 I could not believe they offer many of their dishes as gluten-free! The entire meal was such a great experience. Their wait staff is delightful and very helpful with navigating the menu to avoid gluten. The setting is beautiful. Jordan described as "if Anthropologie was real life," and Markus said it reminded him of "La Madeline meets Where the Wild Things Are." When did I meet such worldly and descriptive friends? Many of the items in the restaurant are repurposed from old wine bottles, recycled glass or French antiques. 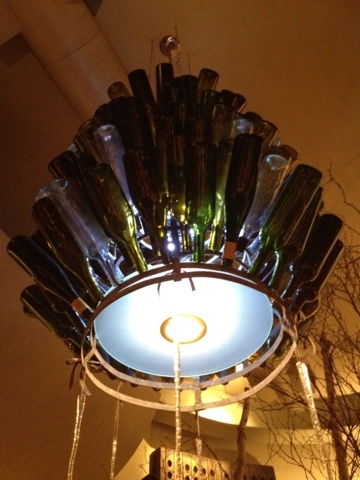 It made my green heart happy to sit beneath this stunning chandelier made of recycled wine bottles. The food was phenomenal. 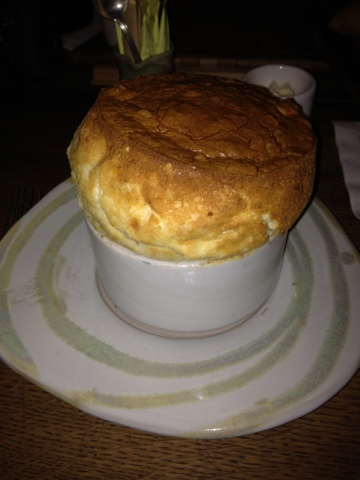 I had a seasonal crab souffle and it was light in texture but with a rich, fresh crab flavor. Crab cakes are a former favorite dish of mine so to be able to enjoy a special crab recipe and have it not leave me with a migraine was a blissful moment. 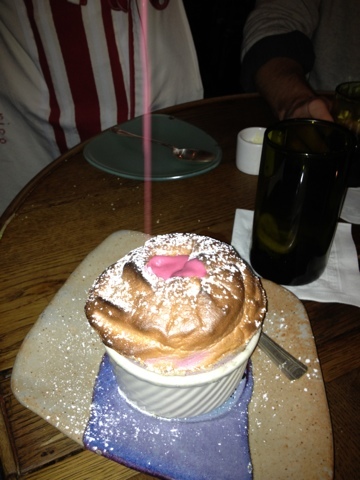 Not all souffles on the dessert menu were offered gluten-free, so I chose the raspberry option. Below is a shot of the homemade raspberry sauce being poured into the top of the souffle. Markus and I were supposed to split this dish but after I'd had a few bites he gave me the rest saying, "By the look on your face I can tell that if I took any more I would be depriving you of a special experience." He knows me so well. After dinner wrapped we were off to see the lights. I've put the list of my top light picks below, with the show stopper closing out my list. We hit all three of these on Friday and I recommend doing the same as they are all unque and make the season bright. Just as a disclaimer about who I am, if I am north of 635, it's a pretty big deal. I make the long trek every year for the Deerfield lights. This housing community in Plano does a Christmas decorations contest year each and all of the resident bring the heat. Deerfield has a really good mix of classy, campy and car-stopping displays and they are all back-to-back if you follow the light tour signs as you enter. If you drive around Highland Park the day after Thanksgiving (official Dallas put-up-your-lights day) and expect to see dads with ladders and staple guns, you are wrong. Almost all of these lights are professionally installed, which doesn't bother me in the slightest when I am sitting under a messive tree draped in warm colored lights. The best route through Highland Park is to take Preston down to the area, doing a lap through Highland Park Village to see their jaw-dropping white trees, and the take a right on Beverly where it meets Oak Lawn and wrap your way back up to Mockingbird. Finish back at Highland Park Village for a cocoa from Starbucks. Farmer's Branch is where the lights made for and by the hardworking middle class live. I love these lights becuase they're homespun and a little wonky at times. Drive up and down the Marsh and Valley View and see the streets glowing with Home Depot projects. 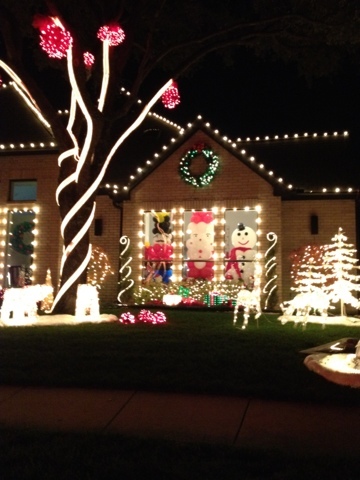 The best light show in Dallas resides at 14535 Southern Pines Cove. Please go see these lights and if you can, bring a canned good for their drive. But do yourself a favor and save this spot for the end of your tour, as every other house dripping with lights will look like the dumbest thing ever after the blinding, computer programmed majesty of this cul de sac. What are you special holiday traditions? Any good areas in Dallas for lights that I missed? Thanks so much for all the great info on the best Christmas lights. I've been looking for an "insider's" guide, so to speak:) Have lived in DFW area all my life and now that I have 3 kiddos, this is just what I've been looking for, especially the exact routes to take. So thanks again!!!!! Found this on Pinterest!! Love that place. God bless!! There is a cul de sac near Royal Ln and Abrams, Timberhollow Circle, that does the 12 days of Christmas, they have done it for years. My kids grew up asking to go there every year. as you drive up ElDorado you can see a large display across from the park -"Jesus is the reason"